Illuminating Powder for alle typer hud. Pulverets konsistens føles silkemykt på huden og gir en delikat glans. Reflekterende partikler liver opp hudfargen og gir huden en sunt og strålende utseende. Pulveret er perfekt for å framheve kinnben, eller brukes til å markere skuldre eller nakke. Delicate pencil is perfect to emphasise the eye. It is extremely soft, which is very easy and pleasant to apply. The content of vitamins C and E nourishes the delicate skin around the eyes. Define your look afresh! Unique and one of a kind eye make-up product which allows to emphasize look perfectly. Starting from gently stressed line to incisively graphic one. 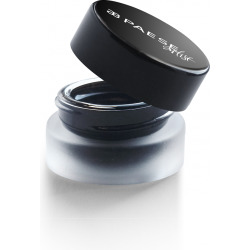 Gel, unusually ductile consistency allows to achieve smoky eye perfect. It is waterproof and it doesn’t smudge and rub out.